Despite occupying roughly two per cent of global landmass, cities account for more than 70 per cent of the world’s carbon emissions. The biggest source of greenhouse gases in cities? Commercial buildings. Thankfully, with climate change now at least being recognised by most world leaders and industry stalwarts, there has been a tangible and conscious move to ‘go green’ in metropolitan areas. The Green Building Council of Australia (GBCA), for example, has joined forces with the World Green Building Council to launch a national ‘net zero’ building certification and training program. “Our built environment presents some of the cheapest and fastest opportunities to reduce our emissions – and we can do this with proven and readily-available technologies,” says GBCA chief, Romilly Madew. Below are four structures from around the world that prove it’s possible to deliver very low to net-zero commercial buildings in our cities. The Bullitt Center in Seattle, Washington, brings together many of the most commonly-used ESD initiatives – composting toilets, toxic-free materials and FSC wood, among others – and applies them “in one place at the same time”. As a certified Living Building by the Living Building Challenge (version 2.0), the project is designed to be energy-efficient, but ultimately relies on the behaviour of its tenants after completion to ensure all net annual energy needs are supplied with onsite renewable energy sources. This is achieved via a dashboard system that shows real-time data about energy and water use. Other sustainability features include an overhanging 14,303-square-foot photovoltaic rooftop and façade, which supplies enough energy to power the building; a 56,000-gallon underground cistern that collects and reuses rainwater; 400 feet of geothermal walls; and composting toilets throughout the six-storey structure. This latter is a world first. All workstations in the building are within 30 feet of large, operable windows (82 percent of the building’s interior has access to natural light), offering workers direct access to fresh air and natural daylight. The project team spent more than two years identifying and selecting materials and products that did not contain ‘Red List’ hazardous chemicals, such as PVC, cadmium, lead, mercury and hormone-mimicking substances. Two years after opening, reports revealed that the Bullitt Centre generated 60 percent more energy than it used. This meant tenants did not have to pay anything for their energy usage, since they had already met their budgets. 100 percent GreenPower supply purchased from Origin. The free electricity generated by the solar PV system will offset the additional operational cost of the GreenPower. Sustainable principles – such as occupancy and daylight-controlled LED lighting systems and heat-recovery air conditioning systems – also guided Floth’s ESD design for the building. The project has been recognised as the first in Australia to have achieved both a 6-star Green Star – Design and As Built v1.1 rating and a 6-star NABERS Indoor Environment rating. 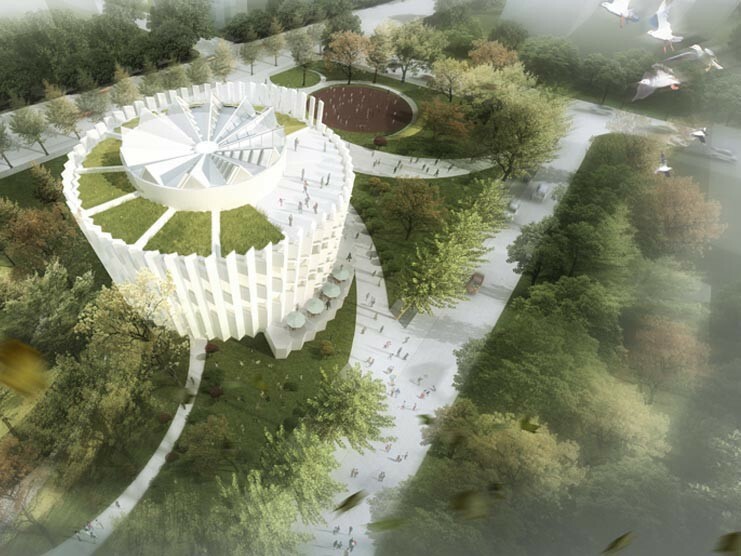 Nanjing Green Lighthouse, a circular building located in Nanjing’s pilot area for sustainable urban development, is said to be one of the first zero-carbon buildings to be constructed in mainland China. Consuming less than 24 KwH per square metre of energy every year – with the remaining energy load offset by PV panels – Nanjing Green Lighthouse’s claim to be zero-carbon relies largely on its sophisticated façade design. “With the assistance of a multidisciplinary team and 3D tools, optimised areas of window and skylight have been calculated to achieve maximum efficiency with minimum use of high-performance façade openings,” the architects stated. The project’s meandering façade utilises operable openings and daylight horizontal reflectors. Together, these minimise exposure to the direct heat of the sun, and ensure that only soft natural light enters workspaces. A light-filled atrium, which channels light and fresh air to all floors, additionally contributes to the building’s 200 LUX natural daylight-level achievement for all permanent working areas. According to BREEAM, a UK-based ratings agency, The Edge by PLP Architecture is the greenest office building in the world. BREEAM awarded the design a 98.4 percent sustainability rating – the highest score it has ever recorded. The Edge, located in the centre of Amsterdam’s Zuidas business district, is certainly a green project to remember. Its design began from the nucleus – a 15-storey atrium interspersed with bridges and exposed lift cores, which acts as the social heart of the building and seeks to redefine what an office looks like. The atrium also has an ESD purpose. Large floorplates are organised around this north-facing space, meaning natural daylight is able to reach most offices. By creating a chasm between offices and the outside world, the atrium also doubles as an environmental buffer, reducing energy use throughout the year. Meanwhile, the load-bearing structure and smaller, glazed openings of the south-facing façades provide thermal mass and shade. Here, solar panels fill the façade where there are no windows. Together with the PV panels on the roof, this allows The Edge to use 70 percent less electricity than a standard office building. Sensors and other smart technology comprise the final piece of the puzzle. Customised LED panels by Philips – which are packed with sensors – provide detailed reports on temperature and humidity readings across individual floors. The Edge’s building management system (BMS) shuts down whole sections on days when fewer employees are expected to be in the office, thereby cutting energy cost and expenditure. Workers are additionally able to adjust the temperature and light levels within their individual workspaces via a smartphone app.